West Falmouth Veterinary Clinic: providing loving care for your pets and serving the Falmouth community since 1994. West Falmouth Veterinary Clinic enters its nineteenth year in beautiful downtown West Falmouth. Our clinic is family-owned and operated by primary veterinarian Dr. Gordon Olmsted and wife Deborah Olmsted. 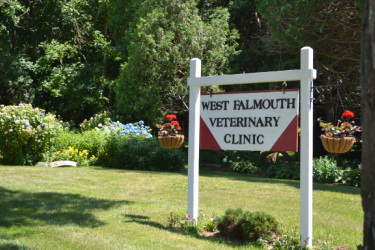 With deep ties to the area, West Falmouth Veterinary Clinic is committed to serving the Falmouth community. We are involved in multiple local organizations for the betterment of animals, including People for Cats and Friends of Falmouth Dogs. Dr. and Mrs. Olmsted have raised four children in town and are personally invested in making Falmouth a safe and healthy place to live. As the owners of multiple pets of our own, including many dogs and cats, we can intimately relate to the concerns of our clients. We have enjoyed long relationships with numerous clients over the years while sharing experiences with their human and animal family members. Dr. Gordon M. Olmsted earned his BS in Animal Industries and his Masters in Animal Biology with a concentration in Parasitology at Southern Illinois University. He then earned his BS in Veterinary Medicine at the University of Illinois and his Doctor in Veterinary Medicine at the University of Montreal. Dr. Olmsted worked at full service veterinary hospitals and did emergency work at emergency clinics before opening the West Falmouth Veterinary Clinic in 1994. Dr. Olmsted attends four to five veterinary conferences a year to guarantee that his practices remain current and efficient. He is a member of the Massachusetts Veterinary Medical Association and the American Veterinary Medical Association. Dr. Olmsted has extended his care for animals abroad, working for the Peace Corps in Africa on two separate missions. His fluency in French served him in teaching the residents of Mali to treat their livestock while administering primary care to their horses, cattle, sheep, goats, and camels. He returned to Africa to serve as a Peace Corps trainer in Zaire (currently the Democratic Republic of Congo). Mrs. Olmsted contributes to the operation of the West Falmouth Veterinary Clinic with her BS in nursing and a concentration in critical care in Boston and Hartford, as well as personal experience in small business management.